These days, her name is familiar to but a small number of experts, and even fewer people know her (rarely played) compositions. But that’s about to change: on the occasion of IDAHOT Day 2018 (International Day Against Homophobia, Transphobia and Biphobia), mdw students will be devoting a concert at Schlosstheater Schönbrunn to the works of Vilma von Webenau. Vilma von Webenau’s life has been subjected to little research so far, and the uncertainties begin even with her name: she was born in 1875 as Vilma (also written as Wilma) Weber von Webenau. She was the daughter of an Imperial and Royal embassy councillor in Constantinople, and her grandmother was the composer Julie von Webenau, a student of Mozart’s son Franz Xaver. Following Austria’s abolition of the nobility in 1919, Vilma had to abandon her noble title and from there on signed her compositions simply as Vilma Webenau. But even so, researchers as well as Wikipedia typically refer to her as Vilma von Webenau without any further explanation. The reason for this may be that her aristocratic origins represented a crucial factor behind her musical training. Her family background enabled her to enjoy the kind of education that was denied women from less well-to-do circumstances. And with a grandmother who was esteemed as a composer and virtuoso, she was in an exceptionally good position to launch a career in music and began giving her own concerts while still a school student. But Vilma von Webenau decided against a career as a soloist: in 1898/99, she became the first woman to take private lessons with Arnold Schönberg, with whom she studied harmony, counterpoint, and composition. She eventually even followed Schönberg to Berlin in 1901 when he assumed the musical direction of the literary cabaret Überbrettl. And this period also saw Vilma give concerts in London, which is one of the few things we know about her career as a performer. Once returned to Vienna, she went to work as a music teacher and composer, with her own music being introduced to the public in 1907 at Schönberg’s first concert of works by his students. We also know of a further concert including works by Vilma von Webenau that took place in November 1908 in the Golden Hall of the Musikverein. Thereafter, she wants to study instrumentation with court composer Fritz Cortolezis in Munich, from where she departed in 1912—and from then until 1922, we have no information about her whereabouts. Did she return to Vienna? Or move to Graz, where her mother lived before passing away in 1922? After Webenau’s early years, clues as to her life become more and more difficult to find. She involved herself in the “Club der Wiener Musikerinnen” [Club of Viennese Woman Musicians] and held lectures at the “Neuer Frauenklub” [New Women’s Club] on Tuchlauben, although just when she did exactly what is often difficult to say since much of the documentation—including her correspondence with Schönberg—is undated. 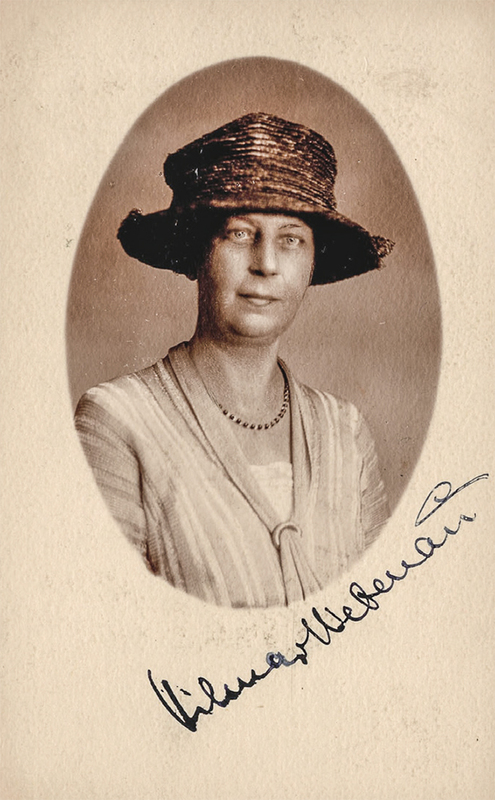 In an album that Schönberg’s students compiled for his 50th birthday in 1924, she concluded a short autobiographic sketch of herself with the following: “I now live in Vienna is a very insignificant composer and music teacher.” Although Schönberg thought highly of his student, Vilma von Webenau evidently didn’t have the self-confidence necessary to make her way as a composer. Or had rejections and failures in the male-dominated musical world of that day moved her to withdraw? Her further life becomes increasingly obscure, and the matter of her personal circumstances gives rise to numerous questions. In 1903, she was referred to as a “companion” of composer Mathilde Kralik von Meyrswalden. Was Webenau perhaps her life companion, remaining—like her—unmarried because she also preferred women? There is no information whatsoever on the final decades of Vilma von Webenau’s life. How and where did she ride out the Second World War? Was she an opponent of National Socialism, or did she support the regime? Her many years of contact with Schönberg would at least suggest that she wasn’t an anti-Semite. As far as the post-war years are concerned, she is said to have lived in poverty, occupying a small room in the 21st district. The next—and final—clearly documented piece of information we have on her is that she died on 9 October 1953. Years after her death, her musical legacy—consisting of over 100 works including string quartets, Lieder, symphonies, ballet music, orchestral works, operas, and Singspiele—was turned over to the Austrian National Library. And for IDAHOT Day 2018, the Referat für Frauenpolitik und Queer [Women’s and Queer Policy department] of the mdw’s Student Union (hmdw) will join forces with the mdw Rectorate, the Primavera Festival, and the centre for gay and lesbian culture and history QWIEN to stage the first-ever concert to be devoted entirely to works by Vilma von Webenau. Webenau researcher Susanne Wosnitzka will be providing an introduction to this survey of Vilma von Webenau’s oeuvre, which is being programmed by conductor Attilia Kiyoko Cernitori. IDAHOT Day has been held on 17 May every year since 2005 as a day of action against homo-, trans-, and biphobia. This day of the year was chosen because it was on 17 May 1990 that the World Health Organisation (WHO) made the decision to eliminate homosexuality from its International Classification of Diseases. Since then, homosexuality (in contrast to transsexuality) has no longer been officially classified as a psychological disorder. Numerous organisations from Vienna’s queer community have already announced their involvement in the day’s activities, and voluntary donations collected at this evening’s event will benefit Queer Base—a project that works to support queer refugees.